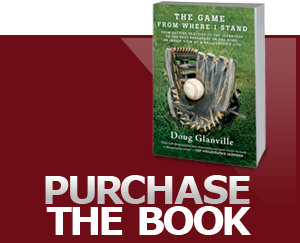 Doug Glanville is quite possibly the classiest man to ever play Major League Baseball. In all of the years I went to Veterans Stadium I never once saw him turn down a fan for autographs and he frequently would stay until he made sure everyone received his signature. Because of this I have a fondness for him and thought for his birthday, August 25th, I would honor him by letting you know five statistical facts about him. Doug Glanville has known Marlon Byrd a long time. Glanville, a baseball analyst for ESPN, played with Byrd during his early days with the Philadelphia Phillies. Byrd, 36, was originally selected by the Phillies in the 10th round of the 1999 draft and will be returning to the Phillies. Doug Glanville is one of those real-life "triple threats" that you occasionally hear about. A gifted athlete (nine seasons of major league baseball), an intellectual (Ivy League graduate and author), and -- in this age of in-your-face self-aggrandizement -- a genuinely thoughtful and modest man. As I push my 4-year-old daughter on the swing, I wonder when the day will come when she will not need me to supply the power. My children remind me that time is marching on even when the frenetic pace of a parenting day convinces us that we don’t have time to age.